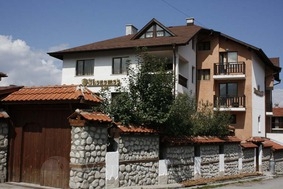 Ikonomov SPA Hotel in Bansko ski resort in Bulgaria. 10 % discount until 10 Nov 2018! Location: Ikonomov Spa Hotel is situated in close proximity to the first station of the cabin lift and offers a beautiful view over the mountain. Accommodation: The hotel offers 2 double and triple rooms, 1 apartment and 1 small luxury apartment, each with separate toilet and bathroom with a hair dryer, refrigerator, cable TV, minibar, a wonderful view to the mountains. Wine & dine: Ikonomov Spa Hotel offers a cozy restaurant and a spa center! Enjoy our indoor barbecue in the winter and our lovely summer garden in the summer. Spa centre: The hotel offers a spa centre with hot tub, sauna and wide range of massage therapies.